Sitting on the top of the world, six miles from the Continental Divide in the Rocky Mountains, inside the clouds with the first flakes of winter falling, we find on this calendar date the Twenty-Fifth Anniversary of Mr. If taking title on the ‘property’ of Love Shovel Ranch. Perhaps some reflection is called for. End of the 20th Century: Them was scramblin’ days. The purchase of LSR, along with tales of a fiancé, was useful in terminating parole early (sounded like rehabilitation, didn’t it?). Immediately the Ranch was occupied with poets, painters, and musicians. Shortly thereafter motorcycles and chainsaws arrived, and a Hammond organ on the patio. A couple dozen poultry, several cats, and Trixie the Stunt Dog completed the initial collection. Those first few years were a flurry of creativity. Three scholar-poets in residence, words flew like supra-moral lightning bolts illuminating the dark corners of poesis. Poets so entwined they wrote each others’ poems (which is problematic when you’ve been mulling a theme and the other guy writes it up spontaneously). Boar Hog Press was founded to distribute non-academic Front Range writers. BHP chapbooks such as “Brag from South Arapahoe Peak”, “Contraband”, and “The Genericon” (all currently out of print) coalesced important topics in the Boulder-Denver poetic community. Within 14 months, two children had been conceived at LSR, and a third directly related to our Beltane rituals. During this period many of the Beat Poets were still alive. In ’94 the Kerouac School in Boulder held an anniversary conference, and all of Allen’s living friends showed up. In the face of the hag-controlled Beat-puppet show, there was some internal dissent. The LSR crew was happy to fan the flames. Hedonistic Immediatist anarchists proclaiming Temporary Autonomous Zones showed up with Wyoming fireworks and were accused of launching them into the alt-right Christian Promise Keepers on the CU practice field. Unauthorized substances plagued admin in ways that spin could never fix. Mr. If, as trickster avatar, arranged the meeting of two notorious Gregorys (the once-banned Corso & the uncompromising Greyhawk), which left Varsity Townehouses in shambles in less than 24 hours. Never was so much fun had letting a pair of demons loose in Boulder! The “Oughts”: Children changed the free-for-all anarchist dynamic of LSR, and by ’99 it was nuclear family occupied. Creativity went mostly into the kids, relationships stagnated and not much poetry was written into the list of responsibilities. The sound of television, previously unheard at the Ranch, became the norm. Mostly everyone was less-than-happy there for half a decade and more. The increasing usefulness of the computer did nothing to maintain a sense of community. Escapism via media was our family activity. On a positive note, Mr. If was summoned in ‘05 as historian-scholar in the recovery of the operational 70 ton Bucyrus 50B steam shovel that now leers unfired in downtown Nederland. Breaking free of that suffocating pattern at LSR was costly and ugly for too long. Half of that family no longer speaks to the other half, and hasn’t since 2010. Intervention by the State apparatus was of serious consequence, the heavily biased system of family “law” created artificial leverages and challenges, and the family never healed because of that corrupt ontology. Imagine: you (parent) must be On Time all the time (w/ kids!) or face Sanction. Imagine: the amount of artificial stress that places on single-digit age children. Eventually the leverage got to the point that we lost control of the Ranch for a year. We returned in 2011 to find the interior destroyed – knee-deep in trash and frozen pipes had flooded several rooms. The cleanup took months, but in 2012 we re-occupied and formally named the Love Shovel Ranch. The “Teens”: That Spring Thomas suggested to Mr. If that he should teach a poetry class for the thriving open-mic community, and thus nascent was born Beyond Academia. The influx of poets was such that Boar Hog Press reignited to publish the sorta-annual Love Shovel Review as a platform for apprentice editors (new each issue) to feature local poetry and art. Wednesday night Big Pasta Dinner (founded during exile) morphed to include the Jug Shovel Jam and one wintery night we fed 52 people at a standing room only mead-fueled frenzy. The subjects of philosophical discourse in the mornings over coffee and cannabis would have been decried as heresy in the prim halls of Academia. As things happen, Mr. If had to journey East for 10 months to aid in the healing of our family matriarch’s cancer. During that period the lure of just-became-legal marijuana and a less than capable house leader let the Ranch fall into a drugged stupor of dabs. Not only did these dumbasses start the kitchen on fire cooking drugs, but they allowed junkies into the house, which ended with the junkies (once known as such) getting tossed, calling the cops on themselves, and catching an Attempted Murder charge. One place where the BoCo LEOs and LSR meet is in our complete intolerance of junkie behavior. While in the East, using the wonders of social media, Mr. If organized the first BAFS Summer Poetry Camp, to take place in July 2014 at LSR. 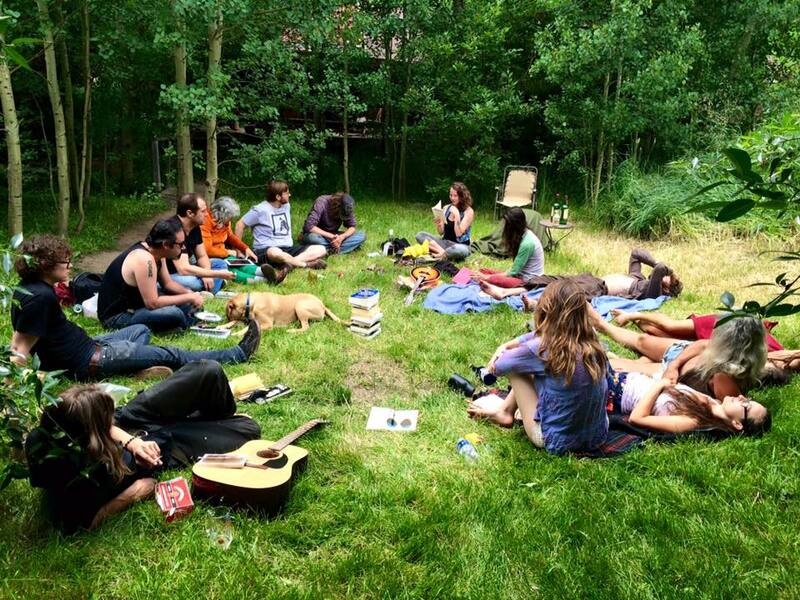 Of a sudden the Beyond Academia concept became an anarchist Free Skool, with ten instructors and over 50 student-participants at that first two-week Camp. It was around this time that soon-to-be Professor Montgomery founded the Boulder Poetry Tribe website and the Love Shovel Ranch website went live as well to promote BAFS. In March of 2015, the combined BAFS/LSR/BPT crew staged the first ever Frozen Dead Poet Slam at the nationally renowned Frozen Dead Guy Days festival in Nederland, a tradition we continue annually. In 2017 Beyond Academia incorporated as a non-profit, with the fiscal sponsorship of the Boulder County Arts Alliance, and we are now able to pay our instructors (via tax-free donations), an occurrence only barely conceivable back in 2012. The Lessons: So what, after 25 years of mountain crazy poetry, have we discovered in the chaotic community of Love Shovel Ranch? Smaller lessons, such as no dogs might mean fox and weasel instead, or put your hand in the ashes before you blindly dump them, or proper safety doesn’t mean you won’t be attacked by even hand tools; there were many opportunities to be observant. Certainly the incredible change in climate, from a windless frozen -30 degrees one Imbolc last millennium to regular rain on that winter holiday 20 years later is a quiet reminder of impermanence. Some of the things we’ve learned were entirely subconscious, impugned upon us by years of living in wilderness. Perhaps the five biggest lessons we can convey are listed below. 1.) Due to the tribal nature of community living beyond a nuclear family, a charismatic leader is necessary to retain cohesion. The Winter ‘13-’14 lack thereof at LSR devastated not only the house itself but also finances and goodwill. Such a leader need not be an elder, but must ennoble respect for the community precepts. A meritocracy with zen tyrant veto (to prevent loud pink houses) seems to work best for tribes. 2.) Don’t live with your lover(s). In single-home community living, this means a whole lot less drama that your housemates have to put up with. And it gives you a retreat for emotional or artistic purpose. These are two primary psychological issues that must be addressed, especially in community. 3.) The great god Entertainment is our enemy. Smoking & drinking are favored pastimes at LSR, but two or more days in a row of such is just mindless belligerence. Daily retreat into modern media leaves no time for human relationships, which can never be as engrossing as the next cliff-hanging episode of some networked fantasy – i.e. the “News”. Allow such entertainments to dominate your existence and “you” cease to evolve. 4.) The ‘Winter Project’. The means to combat the curse of Entertainment is continual self-education. Your humanity suffers from its lack. In wilderness deep winter no amount of entertainment will override ‘cabin fever’; eventually if you have created nothing but wood and hot water you will lose your own personal cohesion. 5.) Stupid Money. Defined as: “So much money you pay someone else to think about it.” Unfortunately this is not an attainable goal except by possible recognition of your own uniqueness, which is not a career path but a life choice. Most of us have found greater happiness not chasing the false hopes of the dying Middle Class, it’s widescreens & motor cars, collapsible baby carriages & nagging retirement accounts, and chose instead to remain “poor” in that disposable income fallacy but rich in time to experience the “art of humanity” – don’t waste it on #3 above!